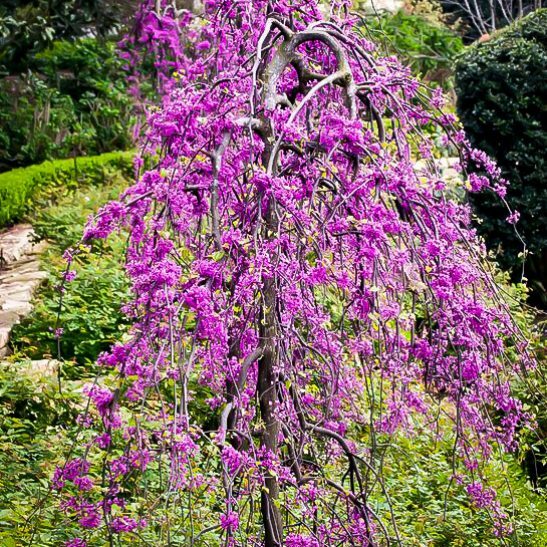 The Ruby Falls Weeping Redbud is a small tree, reaching just 6 or 8 feet tall, with long, cascading branches spreading around it to a width of 5 or 6 feet. In very early spring the bare branches are smothered in clusters of small but powerfully-colored fuchsia-red blossoms, and then, when the new leaves first emerge, they are rich purple, turning burgundy through spring, and slowly becoming green in summer. In fall the leaves are brilliant yellow. Even in winter the brown seed pods and twisted, dark reddish-brown branches create a beautiful sight in your garden. 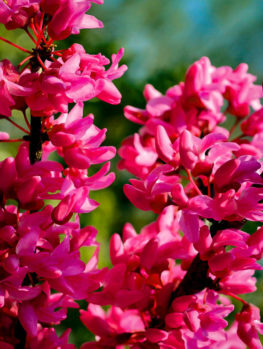 The Ruby Falls Weeping Redbud is unique, but it is fast-growing and easy to grow too. It grows in sheltered spots in zone 4, and throughout zones 5 to 9. It will color best in full sun, but it also grows happily in partial shade. All soils are suitable, including both acidic and alkaline ones, but avoid planting in wet and poorly-drained ones, as this tree does not thrive in wet soil. It is rarely bothered by pests or diseases, needs no pruning, and it is easy to grow, but remarkable to see. 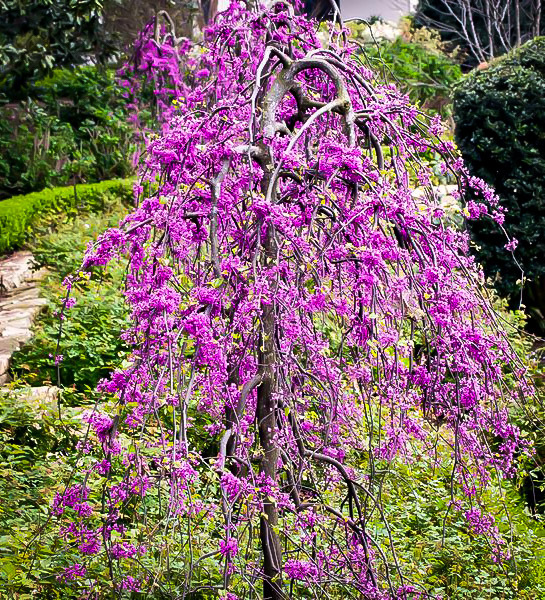 The Ruby Falls Weeping Redbud is utterly unique. 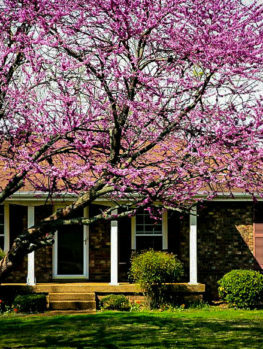 The redbud tree has become more well-known in recent years to gardeners, with newer forms adding purple or yellow leaves to the already-spectacular early spring blooming this tree is famous for. But now it has been turned into a gorgeous small cascading tree that will fit into even the smallest garden. It brings you not only an early-spring display of tumbling violet-pink flowers on its bare branches, but also the rich beauty of purple foliage throughout the later parts of spring. Hardy, easy to grow and reliable, this truly is a waterfall of beauty you cannot be without. 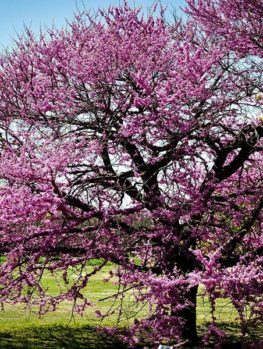 The Ruby Falls Weeping Redbud grows into a small tree, reaching perhaps 6 to 8 feet tall, and spreading its skirt of branches 5 to 6 feet wide. In time, with staking, it would be possible to raise it several more feet into the air, if you wished to. In very early spring, when the rest of your garden is still sleeping, an abundance of buds explode with color. These grow all along the stems, and even sprout directly from the older branches and trunk. In clusters of 4 to 8, the flowers are small, about ½ an inch across, looking like tiny sweet peas (this tree is indeed in the pea family). They might be small, but their profusion, and their vibrant fuchsia-red to purple-red coloring makes them stand out right across the garden. Even a young tree is effective, so with this plant you won’t be waiting years to see a worthwhile impact in your garden. The flowers may be followed by seed pods up to 4 inches long, which are like bean pods, and turn brown in summer. They add an interesting effect, especially in winter, when the leaves have fallen. 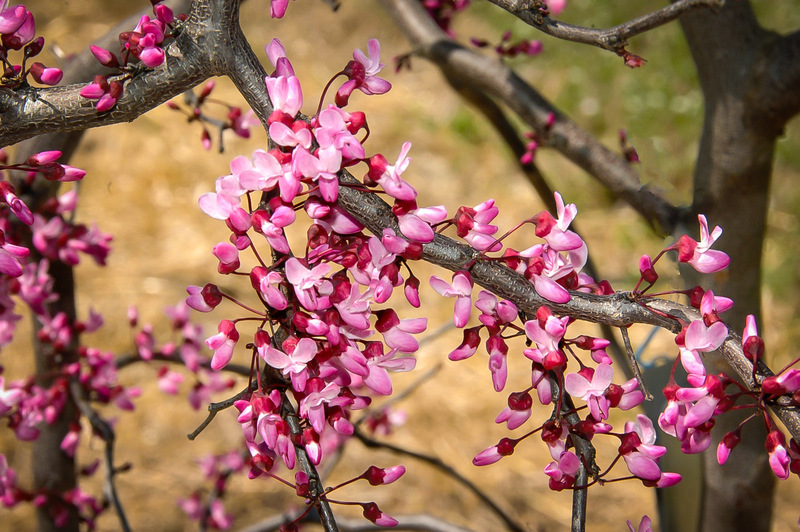 As the flowers of the Ruby Falls Weeping Redbud fade, the leaves begin to emerge, and these are 2 or 3 inches across, rounded in shape, with a heart-shaped base where the stalk joins the leaf to the stem. But it is the color that you will notice – a deep, rich purple tone, with prominent veins and a fine halo of green around the leaf edge. As the leaves mature the purple tones become burgundy-red, and then, as summer advances, they become rich green, blending at last into the garden scene. When fall comes they are back, now turning glowing yellow, adding to the fall glory of your garden. Even in winter the cascading and twisted branches are beautiful, and the rich, dark reddish-brown bark really makes them stand out. What a spectacle this tree puts on, across all the four seasons. Imagine this beautiful cascading tree growing in a corner of a courtyard, or as a specimen on a small lawn. Plant it at the edge of a bed, or on a slope, perhaps above a wall, where it can cascade down freely, and look spectacular. It is even small enough to thrive in a large planter or pot for many years, if you can’t find a spot for it, or you don’t have a garden. 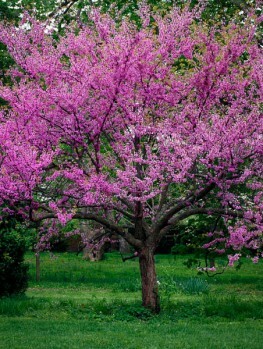 You might think that such a spectacular tree was hard to grow, but no, like other redbud trees this is an easy and reliable tree, which will grow in zones 5 to 9, and in a protected spot in zone 4 too. Plant it in full sun, which will give the richest leaf colors, or in light partial shade, where it will still thrive. It grows in almost any kind of soil, even poorer soils, and it is happy in either acidic or alkaline soil too. Just avoid areas where water lies after rain, and the soil is always wet, as ‘wet feet’ does not suit this tree at all – it should have well-drained soil. This is also a fast-growing tree, adding more than a foot of new growth each year when young, and 6 to 12 inches a year even when older. It rarely suffers from pests or diseases of any significance, and it needs no pruning or special care to thrive in your garden. 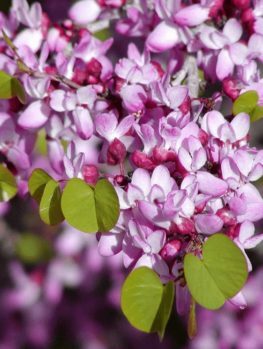 The Eastern Redbud (cercis canadensis), grows from the Great Lakes to Florida and inland as far as Nebraska and eastern Texas. 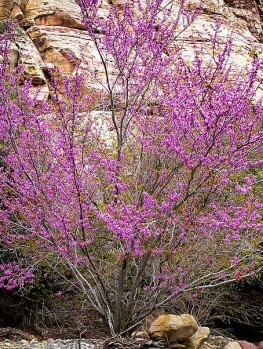 Further west it is replaced by the Western Redbud (cercis occidentalis), which grows well in hot, drier places, and is only hardy to zone 7. 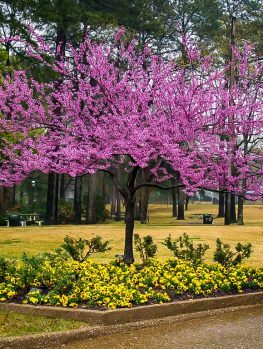 So for cooler zones, and with more rainfall, the Eastern Redbud, parent of the Ruby Falls Weeping Redbud, is the top choice. There have been several new varieties of this tree developed in recent years, and among the most successful breeders are Dennis Werner and Layne Snelling, from Raleigh, North Carolina. Although staff of the J C Raulston Arboretum, part of North Carolina State University, where they have bred some remarkable new seedless butterfly bushes, also carried by us at The Tree Center, for their redbud work they operate privately. Redbuds are difficult to breed, so they build a special netted enclosure and placed two varieties in them, with a hive of bumble bees. One variety was ‘Covey’, a plain-green weeping tree. The other was the beautiful ‘Forest Pansy’, an upright tree with purple leaves. They were able to collect a little seed from ‘Covey’ and grew just 19 plants. They then allowed these plants to breed among themselves. Among the 400 seedlings of the next generation they found 42 with the combination of weeping growth and purple leaves they were looking for. These trees were grown for several years, and the very best one became ‘Ruby Falls’, and was patented in 2011. 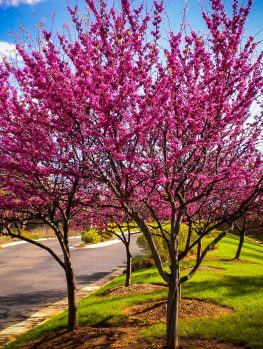 Our trees are grown by taking stem pieces from plants derived from that one original discovery, and attaching them to roots of ordinary Eastern Redbuds. This skillful job is done by experts, who then train the young plants upward to develop their attractive cascading form. 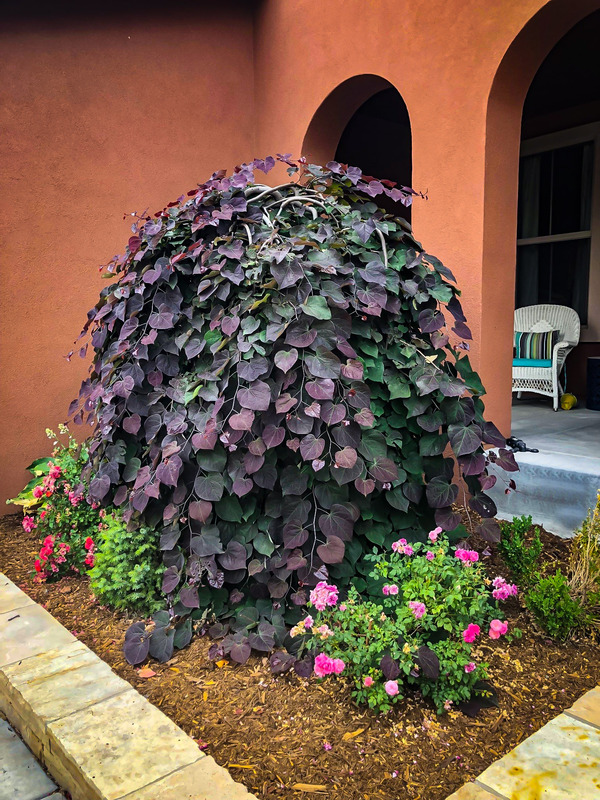 This unique combination of purple leaves and cascading habit is making this plant a top recommendation, and stock is hard to find. We have some beautiful plants, but they will be gone very soon, so order now.